If you are interested in jewelry photography, chances are you have already been involved in other styles of photography. You have probably quickly learned that there are several techniques utilized for photographing different types of objects or subjects so that the results deliver the most optimal, sharp, colorful and detailed image possible. Additionally, different types of cameras and equipment can also be utilized for various subjects, and this also holds true with jewelry photography. It is not necessarily important to spend thousands on a camera and related equipment to capture dramatic shots; what is important are the techniques involved, which can mean the difference between jewelry that appears flat and unremarkable, and a piece that sparkles and dazzles the eye. Getting the shot right every time takes practice. When shooting jewelry, there are some basic rules that should always be followed. It is important to find ways to ensure that there is no glare and that shadows are minimized. Additionally, jewelry often appears best against a clean background of a neutral color, or a background that best compliments the piece. 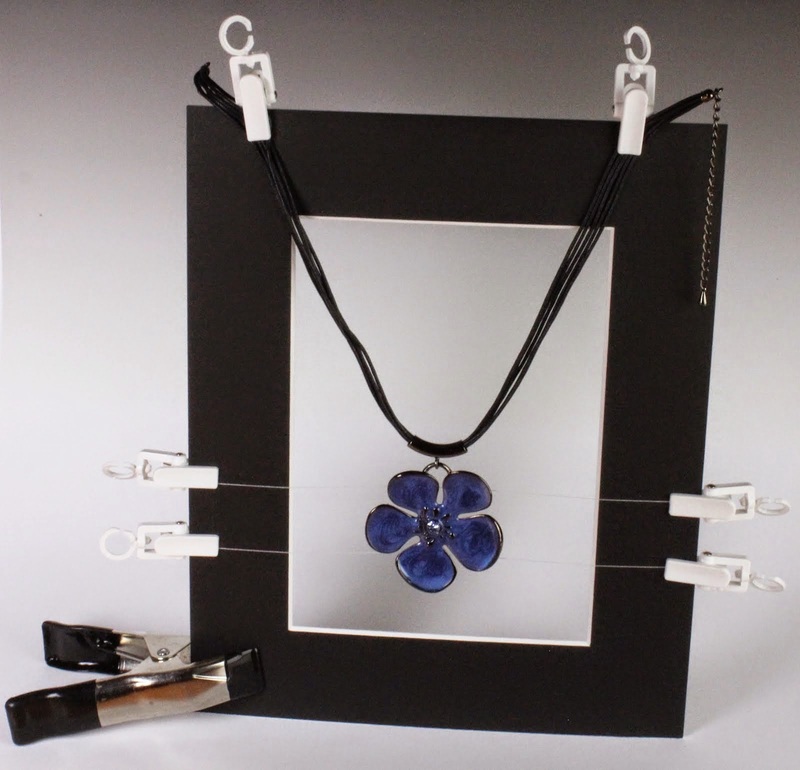 There are also different props that can be used to better display pieces such as necklaces, earrings or bracelets. Understanding how each of these affects a photo and learning how best to use them to your advantage will enable you to take professional, high quality shots worthy of any major magazine pictorial or advertising campaign. This item is a cube-like stand that is open on the side in which you will be placing and photographing the pieces. 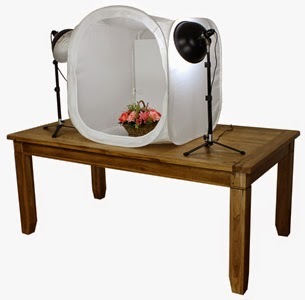 The EZcube light tent is one of the more popular light tents available. The purpose of the light tent is to provide you with a soft light setting, and helps to control reflections and interference from other light sources and shadows in the room. A new EZcube design also allows you to hang items such as necklaces from the center if you don’t have to utilize a prop to hold them. Light tents are available in various sizes. Basic colored backdrops to rest jewelry upon or use as a background. White and black are most typical, but other colors might add a more dramatic effect to certain pieces. Materials include cloth, acrylic, and others. The acrylic can be used to add a nice reflection effect to the photo. There are a wide variety of lights to choose from, and some that add more effects to specific types of jewelry, but the most basic lights you will definitely want to acquire are a set of floodlights that utilize daylight color CFL bulbs. These bulbs are designed to provide a soft, simulated natural daylight lighting effect, which helps to eliminate the need for color correction most of the time. An additional benefit of the CFL bulbs is that they are designed to produce much less heat than other bulbs. Tip: Using the tabletop light set also eliminates the need for using the flash on your camera, which typically does not lead to great photos when shooting jewelry. The flash is too bright and adds harsh shadows or contrast to the jewelry when shooting so closely. Tip: Try to get adjustable stands for your lights as well, so that you can position them correctly for the various pieces. Many light sets come with only two lights, and that is really all that is necessary to get a good shot. Don’t be fooled into purchasing a larger set by thinking that more lights means a better shot. There may very well be instances in the future where you may want to add a third light, but for now, two is standard and feasible. 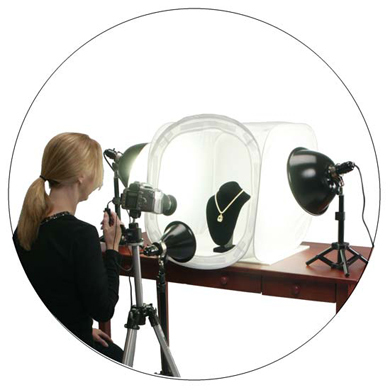 Simply place a light on either side of your light tent, and aim the lights at the jewelry so that any glare is eliminated and your piece is presented in a flattering manner. Tip: Using a stronger light on one side can sometimes produce a more dramatic effect. If you do not have another light that is more powerful, you can try simply moving one light closer to the piece. There are other lights and bulbs that may be purchased that will enable you to produce more dramatic effects in your shots with specific pieces of jewelry, such as diamonds and gems, in which you really want to accentuate the facets. If you really plan on getting the most from your shots, you may want to invest in a few of these lights, such as the Diamond Dazzler LED bulb. Tip: Make sure that the bulbs in use in all your light sources are consistent in model and color or you may have trouble getting a shot without odd coloring. Tip: You can purchase lighting kits containing all of the above elements, instead of getting each component individually. If you are just beginning to get involved in jewelry photography, purchasing a kit can be an economical and easy introduction to the equipment. Focus is of course an important element of all photography, especially when shooting jewelry, in which you really want to capture the detail. One of the biggest agitators of good focus is an unsteady hand. Even the slightest movement can cause you to lose a significant amount of detail in your shot. So it is important to invest in a tripod for your camera. Almost all cameras available on the market today come with several different focus settings. When shooting close-ups of jewelry, you’ll more often than not want to be able to manually focus your camera or utilize a “spot focus” mode. This enables the camera to focus solely on the jewelry at the center of your shot, with a reduction in interference from other surrounding details and items. Using the manual focus will grant you the most control. There really is no right answer to this question. Keep in mind that focus is one of the most important components of jewelry photography, so a digital camera that offers you a true manual focus is definitely going to be important criteria when you attempt to choose. For true manual focus, look for cameras described as SLR cameras. These types of cameras often allow for lenses to be changed as well, which can come in handy as you grow your profession and aim to take more diverse types of shots. The ability to control your camera’s exposure value (EV) is an important element in ensuring your jewelry photos are not too dark or too light. Because most cameras automatically compensate for shooting subjects set against very bright backgrounds, you will need to manually adjust your camera’s EV in order to ensure that you take the best possible shot. You can begin by using the preset EV settings on your camera to see the results, and then select the setting that appears to deliver the most detailed, well-lit shot, without appearing too dark or washed out. As you gain more experience using your camera and become more familiar with the lighting equipment, you will quickly be able to determine the best EV setting for certain shots without having to experiment. Sometimes, even with the right EV settings, the right lighting, and the right focus, you may still get an image that needs a little work in order for it to be perfect. This is where photo image editing software such as Photoshop can save the day and make a good shot great. Tip: Adobe Photoshop is the most popular and widely used software, but you may able to achieve excellent results with the editing options on your own camera, or on your photo layout program such as Apple’s iPhoto, which allows for a wide suite of corrections. Using image editing software, you can adjust lighting levels, contrast, sharpness, color balance, color saturation, and much more to really produce an image that “wows”. There are of course many other aspects of jewelry photography that you will discover with experience, but understanding these basics and learning how to utilize the equipment and your camera properly will ensure that you are well on your way to capturing great images. This entry was posted in daylight, Diamond Dazzler, exposure settings, EZcube, focus, jewellery photography, light tent, lighting, photography, photography tips, Photoshop, post processing, product images, product photography by Jo. Bookmark the permalink.